I have no idea why more people don’t poach their fish in butter or olive oil. 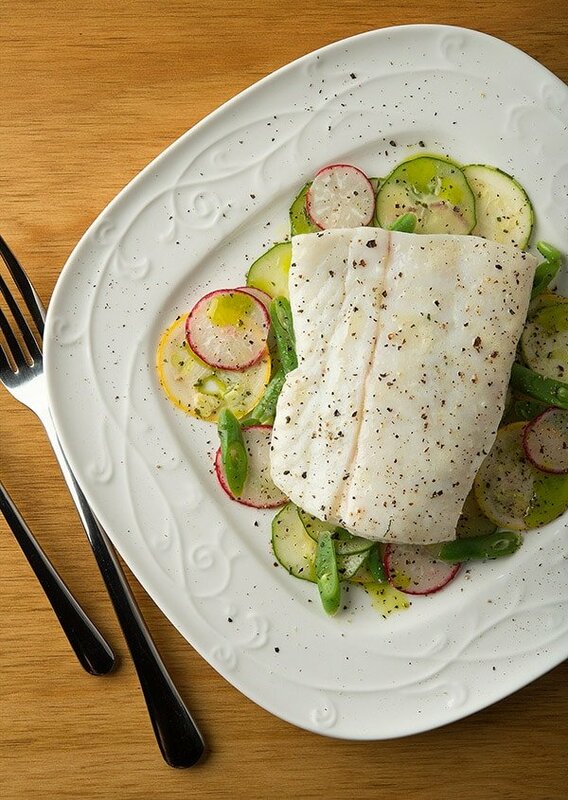 Butter-poached fish is silky and luxurious, yet surprisingly light. It is ridiculously easy to pull off, and works with anything from halibut to perch to salmon, trout, snapper, you name it. Actually, I do know why. It is the elephant in the room. Every time a chef or cooking personality extols the idea of gently cooking fish in a flavorful fat or oil, if you listen clearly you can hear most of the audience whisper: What on earth am I going to do with all that excess butter? It is a fair question, and is the answer why butter poaching is a lot less popular than frying — although, if you think about it, you are often using as much oil or butter in either case. The answer is the same as it is with fryer oil: Save it and use it again. In both butter poaching and frying, you simply run the melted butter or oil through a paper towel to strain out any bits and into a container. You can leave the oil on the counter, but keep the butter in the fridge. But won’t it be fishy? A little, but not unpleasantly so. It’ll be fine with another fish or seafood dish, but you wouldn’t want to put this butter on, say, chicken. For example, I poached this halibut in butter, and then used the butter again with some crab. Why not use salted butter? Well, you could, but I find that in many cases using salted butter results in very salty fish. Professionally, I never use salted butter because I want to control the amount of salt. I recommend that you do, too. Now that we have the elephant safely shuttled from the room, let me tell you again why you really want to add butter poaching to your cooking repertoire. It results in a wonderful, wonderful piece of fish. Now don’t get me wrong, I love fried fish probably more than most people. Hell, I even did an entire podcast about frying fish. But even I can get tired of it during fishing season, when I can eat fish or seafood many times a week. So why not poach fish in broth or even salted water? Well, you certainly can, and it’s great for a fatty fish. I love poached salmon, especially with a horseradish cream. 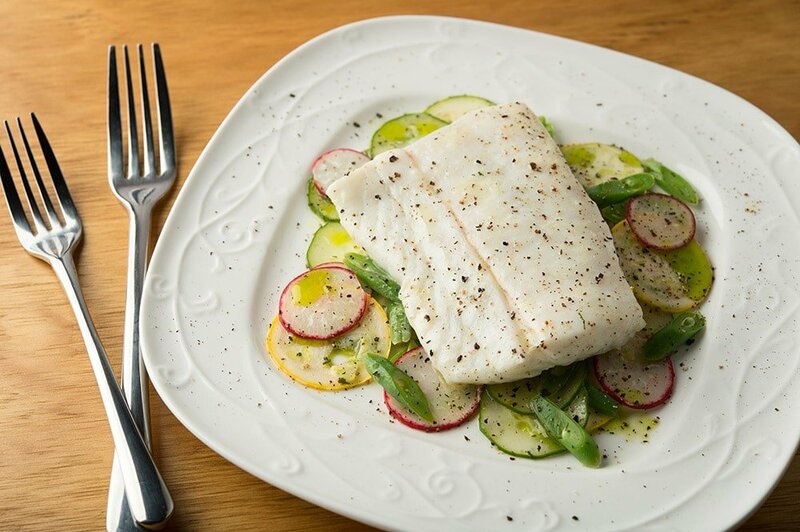 But here’s the thing: When you poach in butter or olive oil or some other flavorful oil, you get just enough fat permeating the fish to make it silky. This is a huge deal with very lean, white fish — particularly freshwater fish. Cook a piece of walleye or bass or bluegill this way and you’ll be amazed. It can actually start to taste a little like lobster. I normally just use butter, but you can flavor the butter with the herb or spice of your choice. Saffron or curry powder will turn the fish bright yellow, for example. You gently cook the fish, too, so it will not seize up like fish tossed into boiling water, or over-fried. You get that pretty flake, and as the flakes begin to separate just a little, the butter seeps in. The texture is remarkable. Finally, butter poaching is ridiculously easy. Easier than frying, believe it or not. Salt fish, melt butter, submerge fish in butter for 10 minutes or so, remove, eat. Try it. You’ll see. Consider this a master recipe. 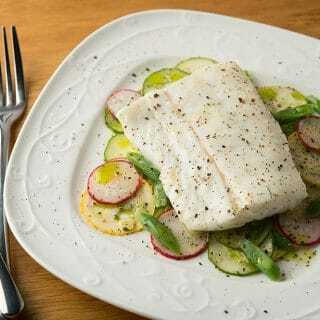 You can play with it a lot by changing the fat -- butter, olive oil, sesame oil, lard, duck fat, whatever -- or the salad underneath the fish, and, obviously, by altering the fish you use. I used California halibut, because it is fantastic cooked this way, but almost any fish will work well here, especially freshwater fish. The only sorts of fish I'd avoid butter poaching would be dark, oily ones like mackerel, bluefish, herring or shad. Other oily fish are nice this way, though, like tuna or salmon, sablefish (black cod), or yellowtail. Salt the fish well and set aside. Slice the squash, cucumber and radishes very thinly into rounds, ideally with a mandoline -- although a knife is fine. Slice the green beans thinly on the diagonal. Toss all the vegetables with a little salt and vinegar and set aside. Melt the butter in a pot large enough to hold at least 1 piece of fish, and ideally 2, at a time, but small enough so that the pieces of fish are submerged. You can use more butter if you want to, or you can top things off with olive oil. You want the butter to be between 150°F and 170°F. When the butter hits the right temperature, pat the pieces of fish dry with paper towels and submerge in the oil. If the fish sizzles at all, lower the heat. You want the fish to cook gently. Let the fish swim in the butter for about 10 minutes for every 1/2 inch of thickness. One way to do this is to put the submerged fish into a 325°F oven for 15 minutes. To finish the salad, add a little bit of the melted butter, or use olive oil, and toss well. Put some on everyone's plate. Gently lift out the pieces of fish and lay them on the salad. Grind lots of black pepper over everything. 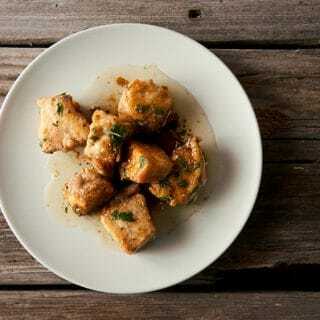 Serve with some good crusty bread. i cannot see what to do with the wine? Shelley: What wine? There is no wine in this recipe. Wine vinegar yes, but that goes with the vegetables. It does say 1/4 C white wine or rice vinegar. I was wondering the same although reading through other recipes, I’ve found that seasoning the pan with the wine with the herbs before melting the butter is a technique that interested me. I get the vinegar with the veggies but probably not the wine part 🙂 . Love every single recipe of yours so far Hank! Looking forward to ordering your cookbook now that you have signed copies back in! WooHoo!